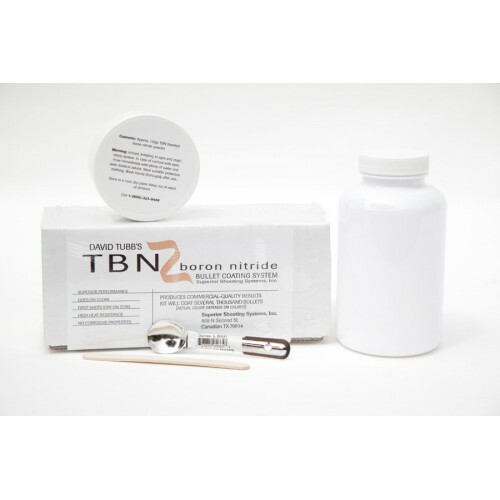 Tubb Precision Blended Boron Nitride Bullet Coating Kit. The Tubb Precision Blended Boron Nitride Bullet Coating System lets you easily coat thousands of bullets with no mess and no guesswork.Used extensively by David Tubb, most recently in his 2011Wimbledon Cup and National Long Range Championship wins, the Tubb Precision Blended Boron Nitride Bullet Coating System uses a proprietary blend that has taken David over ten years to perfect. But the biggest reason to use Boron Nitride on your bullets, the most important advantage Boron Nitride coated bullets have over bare and Moly coated bullets, is that the first shot from a cold, "dirty" barrel will go into the group (of all the subsequent shots). You can't say this about Moly coated bullets, and in David's experience, the first shots using Moly coatings usually go low, and bare bullets are unpredictable. Boron Nitride coating radically reduces the elevation effects of cold (or hot) bore first shot velocity variations that have plagued shooters in the past. This means that the High Power competitor using Boron Nitride coated bullets will not have to worry about elevation changes from the first through successive shots. It means that the hunter taking that all-important first shot of the day can be confident it will go where it is aimed. And the tactical shooter will know that critical first shot will leave the barrel in the same velocity range and go into the same group as his subsequent shots. As David says: "This is huge". The Tubb Precision Blended Boron Nitride Bullet Coating System is very easy to use, and comes with detailed instructions. The Kit lets you coat approximately 10,000/ 50-grain bullets and approximately 3,000/ 300-grain bullets. "I've been working up loads with the HBN from David Tubb's kit. I've found a load that put 7 rounds into a ragged hole .75 inches in diameter..."